Why is acid-base balance important? Are you suffering from persistent stress, chronic fatigue or an unbalanced diet? If you are experiencing any of the above, you might need support to regulate your acid-base balance. For all important metabolic functions to work optimally for optimal health, the body’s acid and base must be in the right balance. Unfortunately, our modern lives make this very difficult. If your acid-base balance is disturbed, optimal functioning of the body will be impaired. Possible health consequences of long-term hyperacidity include chronic fatigue, pain, weight gain and even osteoporosis. Do you need to support your acid-base balance? The body naturally balances the excess acids in food with its own buffers. But if the balance is tipped too much towards acids, for example, due to diet or stress, then your body needs additional support. This support can come in the form of an alkaline salt. The body requires that blood is always a constant pH (level of acidity), within a very narrow pH-value range: 7.38-7.42. It regulates pH by using buffers. Buffers can bind and release acids, depending on the need, but for most North Americans there is more of a need for buffers that have a high acid binding capacity, such as alkaline minerals (calcium carbonate, potassium bicarbonate etc). In a perfect situation, the body will be able to regulate the pH of the blood. However, in North America, most people are too acidic. There are many causes of hyperacidity: our diet (too much protein and not enough fruits and vegetables), stress, medications, external toxins and lack of exercise are a few of the major causes of hyperacidity. When the body has excess acidity, it will pull alkaline minerals from anywhere it can find them in an attempt to buffer the pH of the blood, keeping it within its strict range. And the largest store of minerals is in the bones. A low (acidic) pH will change the way that the cells in bone work: osteoclasts (cells that break down bone) become activated, and osteoblasts (cells that build up bone) become inhibited. 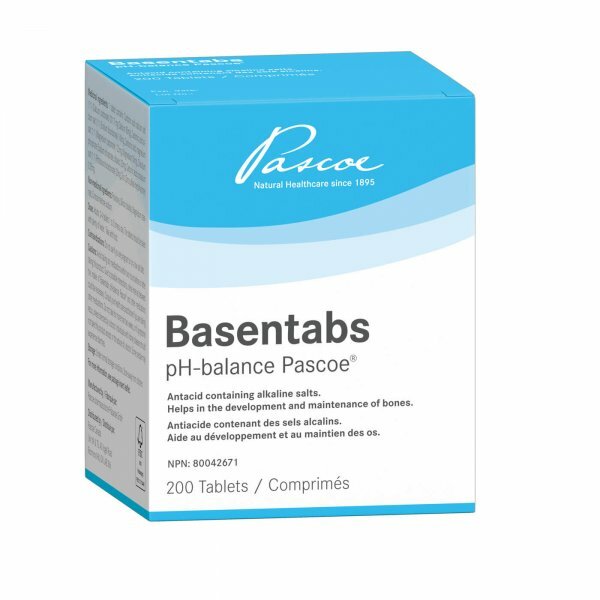 Pascoe Canada's pH-balance Basentabs is an antacid containing alkaline salts that help in the development and maintenance of bones. Add Basentabs to your diet as an alkaline supplement! Zinc is valuable for forming buffers and thus supports a stable acid-base balance. Zinc also contributes to maintaining healthy: skin, the function of the immune system, bones. Minerals, such as calcium and magnesium contribute to healthy muscle function and maintaining healthy bones. In addition, magnesium is involved in reducing tiredness and fatigue. Do not use if you are pregnant or on a low salt diet. Avoid taking any medications within two hours before or after taking this product. Due to possible interactions, a time interval between the intake of BASENTABS pH-balance PASCOE® and other medications could be necessary. Consult your healthcare practitioner if you are taking other medications. Do not take for more than two weeks, or if symptoms recur, unless directed by a doctor. Individuals with kidney disease should not take this product except on the advice of a doctor. Some people may experience diarrhea.